Perfect couples retreat in a wooded garden setting minutes from parks & beaches. Relax and unwind in the peaceful, airy and spacious living space with it's many windows and high ceilings. TV,high speed WiFi and Net Flix are provided to enjoy from the comfortable large sectional. The gourmet kitchen has all new appliances, stove, microwave, dishwasher in fact everything you need to cook a romantic feast for two whilst sampling one of the many local wines. The oversize bathroom shower with heated marble floor & large vanity all contribute to make bathing a pleasure. The Queen bed, with luxury linens overlooks the Japanese garden and woodland oasis where you can enjoy the many birds and woodland creatures living on out two and a half acres from the double french doors at the end of the bed. Enjoy morning coffee sitting on the four hundred sq ft covered wrap around deck also featuring a top of the line Webber BBQ. and comfortable dining and wicker patio suite. A covered gazebo provides an outdoor lounge just steps from the house for relaxing on the luxury patio furniture to read a paper or one of the many books by local and World renowned authors. Just get to know each other again and drink it all in for that memorable special quality time together. Don and I started with this bare site in June 2013 and worked together to design and build our beautiful cottage. It was wonderful even though very hard work to watch our dream come together and become what it today. There for everyone who stays here to love and enjoy as much as we do. We are very proud of the cottage and the wonderful feelings of joy we get when we are at Cain Cottage. We hope one day to build our retirement home on another part of the property. It is the perfect stick finding place for our beloved rescue dog Lakai and our golden retriever Teddy. This is the perfect property for our guests and their pets with the fully fenced two and a half acres and it is so close to everything on the island. Restaurants, shops, galleries, bakery, walks, parks, beaches, pub, museum, Saturday market, the halls where many events and celebrations take place and also the ferry in fact it's perfectly situated for everything. It is also large enough to easily accommodate the cottage, Don's garage, necessary for us both to be happy, as he was a truck driver, & heavy equipment operator, he is now the island boat mechanic, and general monkey wrencher. There is also a good space to build our retirement rancher. One of the most important things about this property is the great well with beautiful crystal clear water thanks to the top of the line reverse osmosis system and water storage area. We do ask guests never to leave their dogs alone in the cottage especially if they howl ! The existing old trees and the peaceful feeling that we get from the quiet of the location of the land despite being so close to everything. We have just installed a new state of the art self cleaning hot tub in it's own gazebo just off the bed room deck. No heavy chemicals and so much better for the skin for our guest to enjoy the massage jets. Large fully tiled bathroom with oversize shower, large marble vanity with lots of storage and a heated marble floor and also wall hot air heater. All kitchen cloths, bedding etc provided and the bed is made up ready for you, also extra throws. All sizes, bath hand and face cloths. Tea, coffee, sugars to get you started, condiments, spices, baking powder, and some basic ingredients. Modern large kitchen with every modern convenience provided including linens. Lots of choice and a huge new library on Island also a well stocked bookstore just along the road. We have stairs to the front door. A charming and cozy little cottage. Within walking distance to amenities and the hosts were excellent. She even dropped by with fresh baked blueberry scones. Would definitely recommend this place. Beautiful home to relax and celebrate at! Our 2nd visiting this beautiful home on fenced property. We relaxed, enjoyed cooking meals and soaking in the hot tub, while also being close to great hikes! A great way to celebrate my 50th birthday! Thank you so much for the lovely review and for choosing to visit us again. I am so glad that you made full use of the facilities and property and thoroughly enjoyed your stay. We really hope that on your 50th birthday made some special memories to take home with you. 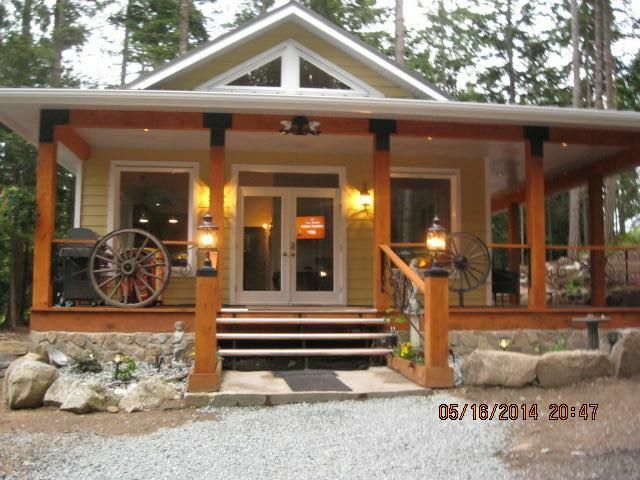 We hope that you choose to come back one day to Cain cottage and Galiano Island. We had a great time on Galiano, due in no small part to our excellent hosts, Sue and Don! The cottage is beautiful, and very well designed - we will definitely return some day. We thank you so much for the lovely review that you wrote. It was a pleasure to meet you both and we hope that if you choose to return that we get to spend more time with you. It was wonderful to go and clean the cottage after your departure and found nothing to do it was spotless. We really appreciate the care and respect that you showed both to us and the cottage as we try very hard to make it as nice as we can for people to enjoy and it is so nice to know that all our hard work pays off. Cain Cottage's setting in the woods is so peaceful. The cottage is very well-equipped in every way. The light streaming in, birds and crickets chirping, views of the trees from the many windows - it all contributes to a very relaxing stay. It is also very close to many island amenities. Sue and Don are excellent hosts as well. Thank you so much for the wonderful review. Don and I are always thrilled to get reviews and hear what our guests have to say. It makes all our work worthwhile. We hope that you choose to come back one day as you are just the perfect guests. This was exactly the quiet retreat that we were seeking- as we were busy with the wine festival and family visits, great place for us and our dog to retreat to after busy days. Cottage is private, on its own property, beautifully appointed and well equipped. Our dog was thrilled to run free in the extensive fenced grounds. We enjoyed happy hours on the nice covered verandah and times in the hot tub. Great place to have as a base for exploring! Thank you so much for the lovely review. It is always a boost to hear what our guests have to say and we love that dogs really enjoy the freedom to run and play which is exactly why we fenced the property. We are so glad that you enjoyed the wine festival and the island. The rates vary according to the season please contact for a quote. Sept 6th to April 30th we charge $200 per night and $995 per week. Monthly rates by arrangement.